The Korea America Friendship Society celebrated the 65th anniversary of the alliance between the Republic of Korea and the United States, paying homage to fallen and living soldiers alike while crediting their comradeship that led to the two historic summits this year aimed at denuclearizing the Korean Peninsula. Nov. 7 will mark the 40th anniversary of the ROK-US Combined Forces Command, created in 1978. 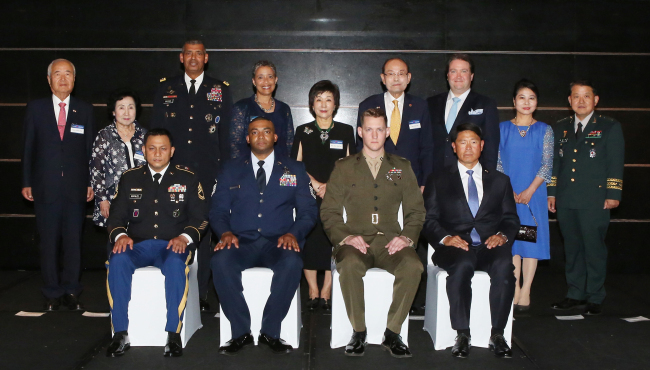 “I would like to take this opportunity to honor the noble sacrifices of United States Forces Korea soldiers, and express our deepest appreciation to all the Korean War veterans who fought bravely to defend Korea and its people whom they never knew or met,” said the society’s President Han Chul-soo at the 2018 Korea-America Friendship Night in Seoul on Thursday. To prevent South Korea from being communized by the North during the internecine war of 1950-53, according to the Pentagon over 44,000 American soldiers gave their lives, along with more than 4,000 others from the United Nations Command. Many more were injured or taken prisoner. Seoul and Washington not only fought shoulder to shoulder in conflicts on the peninsula as well as in Asia and the Mideast, he added, but have fostered a myriad of global partnerships, expanded mutual economic exchanges and shepherded the world toward peace and security. Han was a lieutenant general in the South Korea Army, and also served as the deputy commander in chief of the ROK-US Combined Forces Command before becoming ambassador to Taiwan and Brazil. “This alliance that we have enables us to stand through the wind and cold, heat and rain,” he stressed, arguing the alliance could handle any adversity. Marc Knapper, charge d’affaires ad interim at the US Embassy Seoul, who has acted as Washington’s top envoy to Korea since January last year in the absence of an ambassador, said the two countries may see “greater peace and prosperity” following the North-South summit at Panmunjeom on April 27 and Pyongyang-Washington summit in Singapore on June 12. The American diplomat pointed out that the joint statement produced between North Korean leader Kim Jong-un and US President Donald Trump affirmed a commitment to recover prisoners of war and soldiers missing in action, including the immediate repatriation of those already identified. North Korea’s state propaganda website Uriminzokkiri said Sunday, “It is our unfaltering position to open a new future for world peace and security.” It claimed it has played its part in establishing new bilateral relations with Washington and making joint efforts to build a “lasting and stable” peace regime on the peninsula. The process of repatriating the remains of American troops killed during the Korean War proceeded over the weekend, with the US military sending 100 wooden temporary transit cases to the inter-Korean border to receive the soldiers’ bodies. Separately on Saturday, it moved 158 metal coffins to Osan Air Base in Gyeonggi Province. The reception at Grand Hyatt Seoul was attended by some 300 American soldiers, officers and diplomats as well as another 300 Korean supporters of the bilateral alliance. Five individuals were awarded that night: Sgt. 1st Class Ryan Michael Manuel of the US Army; Personal Specialist Two Antonio Hill of the US Navy; Master Sgt. Christopher Thompson of the US Air Force; Corp. Jose Casiastapia of the US Marine Corps; and Richard Scott of the Department of Defense. Mentioning the Pyongyang-Washington summit -- built on the Panmunjeom Declaration and agreed to the North’s “complete denuclearization,” normalizing the North Korea-US relations and establishing a peace regime -- the diplomat said the “institutional framework” of the joint statement would set in motion a “virtuous cycle” for ensuing negotiations. “And I cannot emphasize enough that any issues related to the alliance will be addressed only through close consultation between the ROK and US,” the diplomat added.